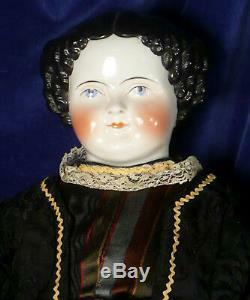 PRETTY 25 1860s FLAT TOP CHINA HEAD DOLL. Black Hair Blue Eyes Blushed Fever Cheeks. 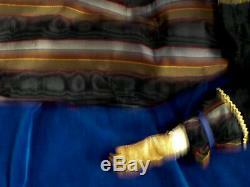 Fabulous Handmade Antique Dress Leather Hands. Either doll factories or their new owners completed the doll. Flat Top shoulder head China dolls were produced in the 1860s. We did not see any markings on this doll but we think she may be German. 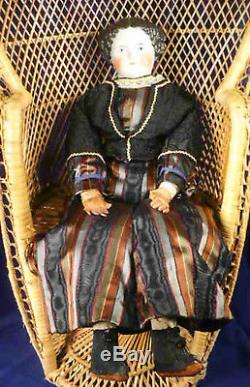 This doll came from a local Historical Museum. She has a museum tag pinned to her slip. HEAD Our old-fashioned girl has a beautiful pale round face with red blushed cheeks, pretty blue eyes, red eye lines and thin brown eyebrows. Her sweet serene smile and pursed lips are a pretty deep pink color. She has a little perky nose. Her molded black hair is parted in the center and styled in the Flat Top style popular in the 1860s with a high brow line and a mass of curls on the sides and back of her head. 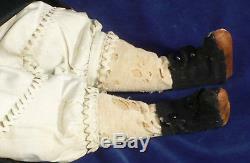 CLOTHING Our 1860's dolls antique handmade outfit is quite spectacular! 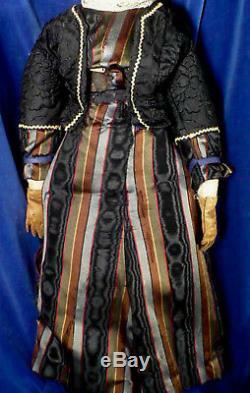 The design and colors are typical of Civil War era dresses. 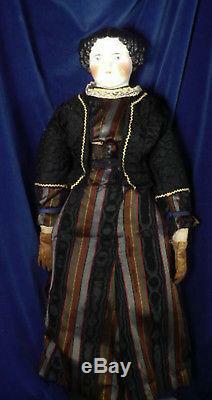 Her wonderful costume is made of three pieces her bodice and matching skirt and a jacket. The 2-piece dress is handmade of a silk striped fabric. It has a fitted sleeveless bodice which accentuates this wonderful dolls narrow waist and a floor length skirt. 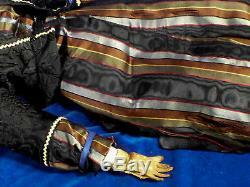 Her black brocade jacket has long sleeves that are trimmed with striped silk fabric. It snaps closed in the front. The skirt and bodice are sewn or pinned on so we did not try to remove them. This lovely young lady is also wearing an antique white cotton half-slip and bloomers. Her high button black shoes are felt with leather soles. BODY We are leaving the dress on this doll because it is delicate and it is sewn and pinned on her. We cannot see much of her body. Her body, arms and legs appear to be made of muslin or cotton fabric. She has a narrow waist. Her hands are leather with outlined fingers. Her stuffing feels like it might be straw. SIZE Our china doll measures about 25 inches from top to toe. 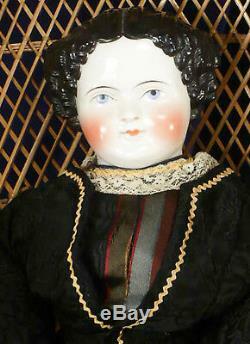 CONDITION This 1860s flat top China head doll is in good antique condition. Her face is very pretty with blue eyes and blushed cheeks. 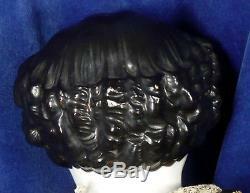 There is a little paint loss on the back of her black hair. We did not notice any cracks or crazing on her head or shoulders. Her dress is made of silk and is starting to shatter or fray mostly on the sides of the skirt. 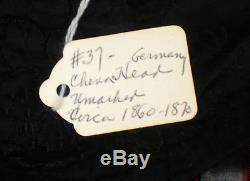 Her black brocade jacket is in very nice condition. One of her shoes is torn. Her cotton and leather body seems to be in good shape as well. We cannot see it all as her clothes are sewn on. She is a delightful old China Doll and displays beautifully! Please review our photos, as we consider these a part of our description of condition, and feel welcome to ask questions. 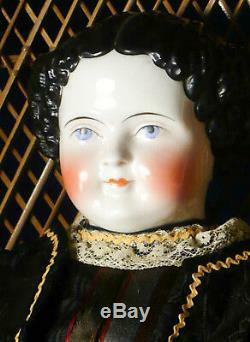 Our Lovely Young Lady would be a quite a treasure for someone starting or adding to their antique China Doll collection. Her clothing is a perfect example of the style and the colors of the 1860s. We are sure she will be someones very special doll! 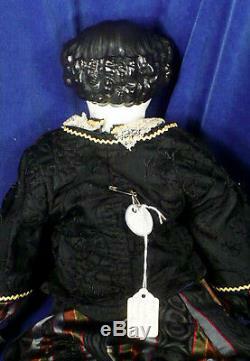 We will be listing these dolls and other doll and dollhouse items over the next few months. We are looking forward to finding homes for our newly acquired treasures! BILL N PEG'S INTERESTING THINGS. We offer beautiful things, vintage things, trendy things, unusual things, nostalgic things, amusing things, collectible things, all of them: interesting things! This isn't a specialty shop because we are interested in all kinds of things. At Bill N Peg's, you will see an ever-changing selection. You never know what you will find! OWNERSHIP: The Bill N Peg? S Interesting Things LLC, a limited liability company chartered in the State of Maryland. In some cases, we will require Signature Confirmation for certain items costing less. The added charge could be more for unusually heavy or large items. When it weighs less, we also offer First Class International as an option. Please be aware that Priority International packages can be tracked while still in the United States, and they can be insured. First Class International cannot be insured, and so the customer assumes a risk for this less expensive choice. The item "25 FLAT TOP CHINA HEAD Doll 1860s Civil War Leather Hands Gorgeous Old Dress" is in sale since Wednesday, February 6, 2019. This item is in the category "Dolls & Bears\Dolls\Antique (Pre-1930)\Porcelain & China".peg" and is located in Baldwin, Maryland. This item can be shipped worldwide.